All of us have our own story, carry our own experiences, and have our own life issues and concerns. How we treat those issues depends solely on us. But sometimes, things that happen around us don’t leave much room to smile. Though, even when it feels like this, making the effort can have benefits well beyond a boost in your mood. Picture it: a smile to your child may mean he or she will inevitably be left smiling back at you. Wherever a smile can be given, even forced until it comes more naturally, the effects on your brain and body are spectacular. Portrait of beautiful with perfect smile. Isolated on white. Smiling not only positively affects those around you, but also the way other people perceive you. Smiling has also been linked to success because it reflects happiness and social approachability. According to this study and many others like it, happiness is linked to a number of positive outcomes including love, friendship, work performance, and health. Our brains function in many elaborate ways to keep us alive—as well as to alert us of threats and danger. When our “threat” triggers go off, our brains go into high speed to keep track of activity and to gather information. And when we find ourselves in a situation we feel like we’ve been in before, the brain does its magic to respond to it in the best possible way based on the information collected and whatever we learned in the past. However, this does not only work for physical realities around us. When you smile, you can actually break negativity and re-program your brain for happiness and positivity. According to behavioral psychologist Sarah Stevenson, each time we smile we throw a little feel-good party in our brain. The act of smiling activates neural messaging that benefits our health and happiness. In scientific terms, the magic happens because certain neurotransmitters called endorphins, dopamine, and serotonin are released by our brain when we smile. These tiny molecules reflect our emotions to the whole body and can bring relaxation, lower our heart rate and blood pressure, and act as natural pain killers and anti-depressants. Filling your brain with joy by smiling can therefore affect your whole body. Dr. Murray Grossan, an ENT-otolaryngologist in Los Angeles, points out that that it has been shown that depression weakens our immune system, while happiness has been shown to boost our body’s resistance to just about everything. “What’s crazy is that just the physical act of smiling can make a difference in building your immunity,” says Dr. Grossan. In addition, smiling can decrease the levels of cortisol in your body because it relaxes you and has also been linked to helping your and your children’s body to produce white blood cells to fight illness. Last but certainly not least, smiling can make you look more attractive (beyond the superficial). A study to investigate brain regions that respond to attractive faces has shown that people who smile are viewed by others as more attractive, reliable and relaxed, and can also influence dating choices. Is smiling really contagious? According to Adrienne Wood, it is! When you see an expressive face, your brain needs to understand what the expression means so that you can react naturally. 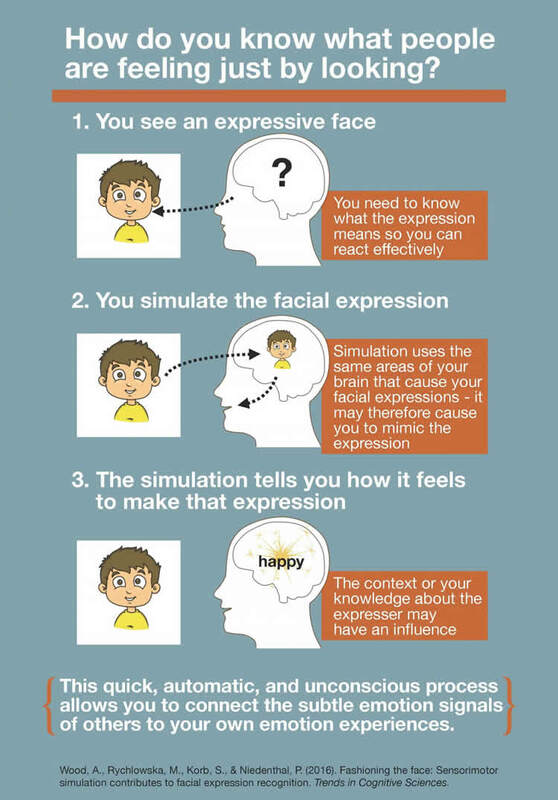 When you see someone smile, those same areas of the brain that cause your facial expression can cause you to mimic an expression on someone else. Your brain then tells you how to feel based on that expression. This automatic process allows you to connect the emotion signals of others to your own emotional experiences and, thus, smile. However, we don’t believe you need studies results to know that smiling is contagious. We’re sure that when you look at other people smiling, it’s hard not to smile yourself. It’s a proven fact that people who enter a place smiling cause smiles in their surroundings. Smiling can affect us all, even from infancy! Smiles are among the first ways your baby interacts with you. A simple smile from you releases chemicals in your baby’s body and can make him or her feel safe and secure. In addition, smiling aids to your baby’s brain and social development. According to WebMD, by encouraging babies to smile, you let them know that their feelings are important and can affect their environment. This also helps infants develop self-esteem. As mentioned above, smiling can fill your brain with joy. For a child, especially until the age of 5, smiling can also affect brain development. The cortex of the brain functions by sending “joy” signals that reach the smiling muscles in the face. When the smiling muscles contract, the “joy” signals are sent back to the brain rewarding it for feeling good. During this cycle, the cerebral cortex is strengthened, and this can bring all kinds of positive things to your child because the cerebral cortex also plays a major role in thought, memory, language, and consciousness. Although smiling comes most genuinely from within, keeping your smile healthy and beautiful on the surface depends on your oral health. And since you’re here, we just have to mention our favorite tips to keep your smile healthy and attractive! This goes without saying. For starters, there are 300 species of bacteria living inside our mouths. A number of these bacteria feed on the sugars we consume and tend to overpopulate, causing all sorts of problems in our teeth and gums. To keep these bacteria under control, brush twice per day and use dental floss to clean areas your toothbrush can’t reach. Like we said, the bacteria in your mouth feed on the sugars consumed. Eating too many sugary foods and drinks can promote cavities and gum disease. Focus on eating foods with healthy sugars such as fruits and vegetables. When you consume a sweet treat, brush your teeth after. And never eat anything after you’ve brushed your teeth for the night! Biannual visits to your dentist mark a key practice to keep your mouth and smile healthy. Your dentist will remove plaque from your teeth at each cleaning and examine your gums to keep risk factors at bay. In addition, your dentist will examine your mouth and spot potential risk conditions for bigger problems. Smoking can bring a plethora of negative effects on both your body and mouth, including gum disease, tooth loss, and even oral cancer. In addition, smoking will turn your sparkling white teeth into yellow. When was the last time you smiled? Share a smiling selfie with us on Facebook and tell us all about it!